Grains and cotton farmers are demanding higher powered, versatile standard tractors that lift productivity. Yet they are also looking for a tractor that delivers economical operation and reduced input costs. 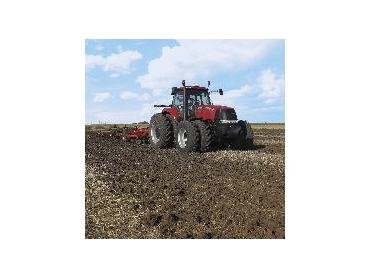 The new Case IH Magnum 335 is just this tractor. Case IH Magnum Product Manager, John Dreves said the Magnum 335 is more powerful in this line of tractors since the Magnum was introduced as the 7100 series 20 years ago. The Magnum 335 produces a rated 205kW (275Hp) at the PTO and offers a 13% power bulge and a 47% torque rise to ease it through hard going such as rocky soils and tough stubble. "Growers are pulling larger, heavier implements in order work more ground in less passes,” said John Dreves. “Yet at the same time, they need to be as fuel efficient as possible. "The new piston design in the Magnum 335's 9-L engine meets the increased power requirements and delivers outstanding fuel economy." The engine is also approved for use of B100 biofuels when Case IH maintenance practices are adhered to. The full cast front frame and soft mounted engine, coupled with a 4.8m turning radius, make the Magnum 335 an ideal one in row crop applications. John Dreves said the new Magnum could help cut operational costs by enabling farmers to switch from their 246kW (330Hp) four-wheel-drive articulated tractor, increasing the work rate of each driver and gaining more utility from their new tractor. The standard 18-speed, Full Powershift transmission has 18 forward and four reverse gears and delivers reliably on the job. Other transmission options include a 19-speed Full Powershift Transmission with a fuel-saving 19th reduced-revs transport gear, and a 23-speed Full Powershift with Shift-through Creeper. A new 19-speed, 50km/h transmission package is also available in the Magnum series. This package includes a suspended front axle, heavy duty drawbar and wide front and rear fenders standard. "More and more implements such as tanks and carts are being rated for 50km/h operation," John Dreves said. "The new package will allow farmers to move from paddock-to-paddock faster and save travel time, especially for those with large acreage operations or where paddocks are long distances apart." John Dreves said this year's Magnum models take the growing popularity of autoguidance a step further with optional full factory installation of Case IH's complete AFS AccuGuide autoguidance system. Previous models came standard as AccuGuide Ready, allowing autoguidance to be added in the paddock. "This is an industry first for Case IH," John Dreves said. "For the first time we are shipping tractors with all the autoguidance components factory fitted. "Growers are adopting autoguidance fast, with smart features and power technologies that deliver the productivity and profitability our customers expect. “Case IH is committed to providing customers with the most powerful, productive, reliable, comfortable tractors that are technologically advanced yet user-friendly and the new Magnum fits the bill. “For example, the new front axle design is rated at 6.73 tonnes carrying capacity to meet today's higher ballasting and power output requirements. "The new standard hitch, with a lift capacity of 8.57 tonnes, is a match for farms moving up to larger mounted implements," John Dreves said. Standard on the Magnum 335 is a new Category 4 drawbar, using a 50mm diameter pin to match the increasingly popular Category 4 towed implements. Vertical load capacity on the drawbar is 4.99 tonnes. There are several new hydraulic options to handle demanding tools such as large planters, air seeders and pull-type sprayers. Standard flow on the new Magnum 335 is 175 litres a minute (46 gallons a minute) and 236lpm (62gpm) on higher specified models.